The Fowler Museum at UCLA presents an exhibit running through July 16 of 11 rare headdresses worn in masquerades held in Sierra Leone’s capital city of Freetown during the 1970s. The complex headdresses on display in “Joli! A Fancy Masquerade from Sierra Leone” reflect the blending of cultural influences and peoples in the port city. The Joli masquerade was performed to mark the end of the Muslim month of Ramadan, and on other festive occasions. Created by Joli Society members, each headdress is composed of an elaborate armature made of bent and twisted wire padded with polyurethane foam and covered with textiles, brocades, velvet, netting, Christmas tinsel, fringe, lace and mirrors. The headdress structures have recognizable shapes, such as a mosque, elephant and biplane (which symbolized Western modernity), as well as mythical and spiritual beings. Additionally, one or more painted wooden face masks are attached to the structures, which are worn on top of performer’s heads. After Sierra Leone became independent from Britain in 1961, an influx of young migrants from the country moved to Freetown. In response to socioeconomic concerns about the integration of the young people, charitable organizations in the city offered food, shelter and activities — including the sponsorship of masquerades — to help youth adjust to urban life. The Zorrow Unity Society and the Young Men’s Muslim Association formed the Joli Society to produce a citywide festival to celebrate Eid al-Fitr, a holiday marking the end of Ramadan. Members of the society created the headdresses they would wear during the festival’s parades. During preparation for the exhibition, the Fowler Museum partnered with the UCLA radiology department’s Translation Research Imaging Center to examine one of the Joli headdresses using a CT scan. 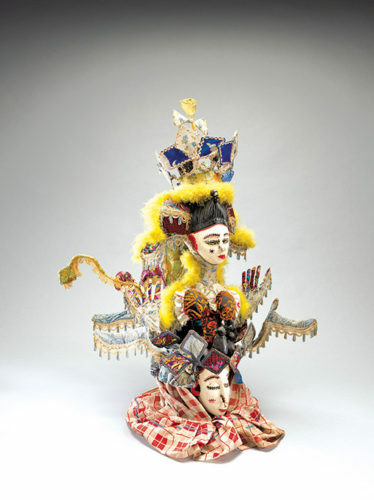 It enables viewers to see inside the headdress to better appreciate the intricate artistry of the elaborate bent-wire armature. Visitors can see the results on a monitor in the exhibition. The Fowler Museum is located at 308 Charles E. Young Drive, North. For information, call (310)825-4361, or visit www.fowler.ucla.edu.